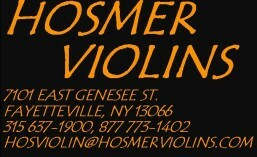 Quality repair and restoration are prerequisites for a violin shop to be taken seriously. Clients, both professional and amateur, should be assured that their cherished instrument or bow is in good hands. In this shop we employ repair techniques perfected by many years of study and practice. When an instrument repaired or set up by us winds up in another professional restoration shop, it is our desire that our work be above criticism. We are working for our clients, but we are judged by our peers. You may think from the above pretentious paragraph that we only work on Strads, and that our prices are out of sight. In fact, though, we work on everything from entry-level to professional level instruments. Bow work ranges from inexpensive Brazilwood bows to Lamys and Sartorys. Repair prices are graded accordingly. For example, seam gluing is less complex on an entry-level violin, and will certainly be less expensive, than on a quarter-million dollar cello. And be assured that we will not take on a job that we feel we are unqualified to accomplish. Many procedures are best performed in large restoration workshops employing numerous experienced craftspersons. We are acquainted with these establishments, and we are happy to refer you to them when appropriate. A written estimate will be provided before any work is performed. All estimates are based on a “worst case scenario,” especially if the instrument is to be taken apart. Very often the final price is considerably lower. Sorry, but no repair estimates are given over the phone. Below is a partial list of many of the typical repairs we do.